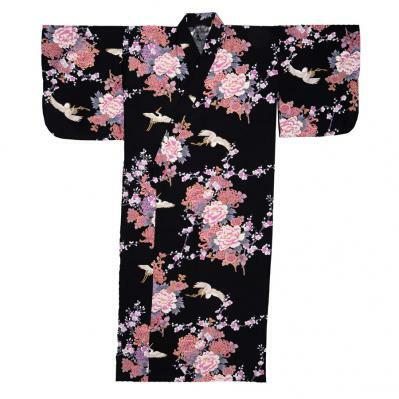 This Japanese Kimono robe features a gorgeous palette of peony flowers and graceful cranes. Peonies are known as the flower of wealth and honor, and embody prosperity and romance. They are regarded as an omen of happy marriages and good fortune. Cranes are considered a symbol of longevity and good fortune. Set against a black background, bold peonies in hues of pink, purple, gray and white are nestled among flying cranes and sakura blossoms. Gold accents are added to highlight the beauty of nature. This beautiful women's kimono is produced of 100% soft and luxurious cotton sateen. Made in Japan. A matching belt is included. This ladies' kimono is available in three sizes: Small/Medium, Medium/Wide, and Large. Small/Medium measures 54" in length, and is designed to fit a woman 5' 4" to 5' 9" in height. The sleeve length is 13", the shoulder width is 24" and the girth is 44".